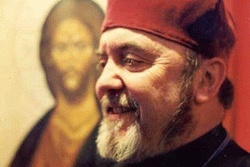 By Father Michael Oleksa, Th.D. 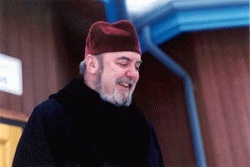 This essay is taken from Father Oleksa's keynote address to the Alaska 20/20 Conference: On the Future of Alaska sponsored by the Alaska Humanities Forum and the First Alaskans Foundation. 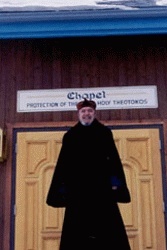 Father Oleksa edited this version for presentation on LitSite Alaska. It used to be relatively simple to talk about the development of community. We had two major communities in our state -- the rural Native community and the urban immigrant community. In the last ten years, however, we have become dozens of communities. I'm not sure the folks who live here in Anchorage, where this transformation has occurred, are aware of the rich diversity that is now our Alaskan heritage. I was living a few years ago near Wendler Middle School in the very middle of this city, and would go over to the school and talk with the principal and meet with the kids. The principal told me that her students came from homes where 88 different home languages are spoken. That's central Anchorage today. We have cultural diversity second only to the state of Hawaii's. The Tolerance Commission discovered this fact during its deliberations the last six months. We have been transformed from an urban non-Native community and a rural Native community to a community that has the world at our doorstep. Therefore, when we talk about culture, it's not as simple as it used to be. What's your culture? It's a hard thing to define, isn't it? Look it up in the dictionary -- Webster is of absolutely no help. They'll start with bacteria for one thing … But when we ask, "What is your culture?" how do you define that? How do you conceptualize it? Talking about your own culture is one of the most difficult things to do, because your culture is the air you breathe. It's the aquarium into which you were born, and it's very hard to imagine what life would have been like if you had been born in a lake or in the ocean. Your aquarium is your world. That's one way of thinking of culture, but that's limiting. I'd like to think of culture as the way you understand the game of life. All games have certain rules and regulations that govern them, basic skills that have to be learned in order to win. If you were born into the culture that organizes conferences like this, you were born into a culture that takes time very seriously. It measures time. You have proverbs like "time is money," and "don't waste time." You talk about time as if it were a quantity or a location. Time is something you can be on or ahead of or behind, and that's why you have to kill a lot of time before it gets you. If you were born in rural Alaska, however, you don't necessarily have that sense of time at all. It's a different ball game, and that's the first point I want to make. If your culture is the game of life as you play it, because it's the only aquarium you've ever been in, we often assume that our ball game is the only ball game there is -- that everyone plays life the same way, according to the same rules, with the same presuppositions and with the same goals. Then, when you go to another culture, you're suddenly up against another ball game and you realize not everybody's playing on the same field with the same equipment, using the same skills to score the same points. What we have going on in Alaska, and this has been since Bering sailed past (you know he sailed past most of it before he found it), is that we've had a cultural phenomenon whereby one group was playing the game of life as they understood it (call them the football players), and another group was playing the game of life as they have always understood it (call them the basketball team). Lately, especially here in Alaska, we've been putting both groups on the same playing field and saying "play ball." You wind up with the phenomenon of tackle basketball, during which each team is accusing the other of playing unfairly, incompetently, or simply stupidly. You think these people are incompetent, backward -- well, you could make a long list of negatives there, because when you're playing the game of life as you understand it and you meet these other guys who you think are playing the same game, and they're cheating -- they're knocking you over -- then you get the sense that they either don't know how or won't play fair. That's what's been going on here for two centuries and more. We've just had a bad case of tackle basketball, and we can talk about that now, I think, if we can conceptualize culture as the way we play the game of life. We've already mentioned how our culture deals with time. Rural Alaskans don't deal with time that way. Time cannot only go forward, but backward. (Now, that's true in this culture, but you need a time machine and some fancy science fiction to do it.) In rural Alaska, in traditional cultures, in tribal cultures all over the world, there's an attempt in a sense to repeat the past and bring it into the present almost constantly. I learned this after years of frustration, mostly from my wife. I noticed that during the time when our four children were about to be born, she got up extra early, dressed and left the house, went out. When I first asked her about this, I said, "Why do you get up early, wash, dress and leave, rain or shine, sometimes in terrible weather, but every morning the way you have been?" She said, "Well that's the way we Yup'iks do it. That's what my mother did. That's what her mother did. It's a custom." All right, but I didn't understand the significance of it. I went to the Yukon River to give a graduation speech and the rumor was, among some of the students, that I could speak like a human being (which is literally what "yugtun qantuten" -- can you speak Eskimo? -- means). They asked me my name. I gave them the answer. They asked me when I arrived. I gave them the answer. And then they asked me the question, literally in Yup'ik, "From where did you exit?" I told them from the dormitory. They looked at me perplexed, shook their heads and said, "No. That couldn't be." I asked them to repeat the question, and discovered that this is a global phenomenon among human beings everywhere -- when you ask someone cross-culturally to repeat the question, and they know that you didn't get it the first time, they say it to you slower and louder. So these guys said, "From where did you exit?" "Na-ken ane-llru-sit?" I came up with another guess -- the airplane, I said. No, that didn't satisfy them either. Finally, I had to flunk my Yup'ik exam, and ask them to repeat the question in English. They changed it from, "Where did you exit?" to "Where were you born?" I realized that in their dialect of Yup'ik, to be born and to exit or go out was the same verb. Then I went back to my wife. "When you go out every morning during your pregnancies," I asked her, "is there a special way you do it?" "Yes," she said, "now that you mention it. A Yup'ik mother-to-be goes through any doorway, especially the exit from the building always head-first and without stopping." The mother enacts birth. This is how to do it, baby. Please, head first and don't stop. That's a pattern that is universal. It's not something the mother just thought up, it's not an innovation her mother created, and it's not something that her grandmother discovered for the first time. It's believed that the first human beings behaved this way. The first children were born in a healthy way because they were born in this position – doing it the right way, the human way, the way nature designed it. You have to live your life in conformity with the patterns and structures of reality in order to be a healthy human being. That kind of teaching is going on in the womb. And that pattern goes back. When a Yup'ik mother-to-be today goes through the hotel door at the Hotel Captain Cook head-first without stopping, she's repeating a pattern that goes back to the first mother and the first parents and the beginning of the human race. So, for a village person, meaningful time can be any time you repeat the pattern that has been handed down to you from the past. If that's where your focus is, if that's the way you live your life, the way you get out of bed, the way you go through a doorway, the way you eat your food, then life is filled with time that passes in a very different way from the kind that we measure with clocks and calendars. I say "time." My neighbors in rural Alaska say "time." We're both speaking English, but we mean very different things, because we experience time so differently. Space is the same way. For a newcomer to Alaska flying over our gorgeous wilderness territory, one mountain's the same as another. They're all pretty, but none of them strike the viewer, the tourist, as more significant than another one. But ask the Native population who lives in that ecosystem about that terrain, and some places have greater significance than others. There are stories behind those mountains. There are stories on that lake, on the lake shore. A few months ago at a conference out on the Alaska Peninsula, I tried to get some guys to talk about their village and why it was important to them. I asked them, "Tell me a story about a place near the village." One of the men in the group said, "I've got one. When I was a boy, I went out on my first moose hunt with my uncle and he took me to a particular place down the river and such. We got to a certain location and we looked further down, and on the hill beyond us a moose emerged from the brush. My uncle said, 'It's yours, this is your moose hunt, this is your moose.' So I raised my rifle and I shot the moose. It went right down and my uncle was so proud of me. He congratulated me on my first successful moose hunt, and we started moving our boat closer, but the moose stood up again. My uncle slowed the boat down. He said, 'You better shoot again.' So I shot a second time, but we couldn't believe that moose was that strong to survive the first shot. We got to the hill itself, and as we were climbing the hill, that moose stood up a third time. My uncle said, 'Well, better do it again.' The third time, the moose went down and stayed down. When we got to the top of that hill, boy, were we surprised -- three moose!' No one's ever written that story down. He said, "Every time I go past that bend in the river, every time I look at that hill, I think Three Moose Hill." You see what I'm saying? When you live on the land for centuries, for millennia, the land itself becomes filled with meaning. Stories, mythical and legendary as well as personal, fill the landscape with a meaningfulness that a casual visitor could never possibly comprehend. So I say "nature," and you say "nature." I say "river," and you say "river." I say "mountain," and you say … It doesn't mean the same thing, because the stories behind them are so different. When we talk about animals, it's even more extraordinary. I've come to realize that in European folklore, we talk about animals as inferior creatures. When a human being gets changed into an animal in European folklore, which is often the beginning of the story, it's something bad. Some sorcerer, magician or witch has turned a handsome young man into a frog, and then the rest of the story is about how the guy gets back into human form. But there are Native Alaskan stories where the hero is able to turn himself into an animal, and in the end, turns himself into the animal one last time and lives happily ever after. So the view of animal life as being in some ways even superior to human life is a rather extraordinary change in one's perception. If the animals see things we don't see and hear things we don't hear and can do things we can't do without a whole lot of expensive machinery, then they're not a lower life form, but in some ways a superior one. So I say animal to my Yup'ik or Alutiiq relatives and it means one thing in their cultural context, and then something else in my own. Time, space, nature -- these things vary cross-culturally. We all assume that everybody experiences time the same way we do. They don't. We assume people experience time, space and nature the same way we do. They don't. And even words are specifically tweaked in this way. I remember going out on the Kuskokwim for the first time about 30 years ago. The belief is that animals, being smart and sensitive and in cahoots with each other, can never be caught against their will. You can't sneak up on your prey. That's even more true nowadays than it used to be in times past. In ancient times, you could walk quietly through the forest or across the tundra. Now we come with snow machines, four-wheelers and outboard motors. The animals know where you are at all times. You don't surprise them, you don't outsmart them, you don't overpower them. The traditional belief is that they give themselves to the hunters who are respectful, who will not waste their meat, who will not waste their skins and hides, who will treat them -- the best word probably in English would be -- with reverence, with gratitude. If the family and the community have been treating them that way historically, then animals will give themselves to members of that community. The hunter's success is not only his own personal experience. There are more than a hundred cultures in Anchorage. This means we have the opportunity here to learn a whole lot of other ball games. We can all be like Michael Jordan who is competent in his own culture, as he was in basketball, but who took the risk of going off to the White Sox to play baseball for a change. I'd like to interview him about that experience. He was very competent, one of the best ever in his own ball game, but he left it behind to attempt to learn somebody else's game and did not succeed with nearly the same glory. I'd like to ask him how much more he appreciates baseball players and the game of baseball now that he tried and didn't become a superstar. You see, that's the problem. With our own culture, we can be competent. We grew up with it. We absorbed its rules without even noticing. We understand time and space and nature our way, the way our friends and neighbors do, the way our own native culture did. But here in Alaska, we have the tremendous opportunity to discover new ways of seeing the world, of understanding reality, of comprehending what it means to be a human being -- and not just by learning one more game, but potentially dozens. We may never be good at the other guy's game. We should admit that. We'll always be more competent, I think, at our own. But we can enjoy and delight in the fact that ours isn't the only game in town. That's one definition of culture – the game of life as you play it. There's another definition that someone pointed out to me a few years ago. It comes from a book, actually. Similar to my idea of culture as game, it's culture as story. What's your story? Not your own story, but the story that started in your culture before you were born. Who were your grandparents? How were they educated? Did they have any formal schooling? Where were they born? In what kind of a community? In what part of the world? And your parents -- how did they meet? Where did they come from? What were their collective expectations for you? This is how culture is transformed into community. A community in the modern world is a collection of cultures harmoniously interconnecting and interrelating. We have to build community deliberately in the modern world. Community used to be there as a given -- your village community, the village of Koliganek that I just left, the village of Old Harbor where I first entered Alaska. The village is pretty much a homogenous community, already intercultural, because the village has absorbed the newcomers of the last century or two, and indigenized them. It made them members of that community, part of that community's history, part of its story, members of its church, parents to its children, Godparents to its other kids -- connected harmoniously. This is harder to do when you have a city of a quarter million and over a hundred cultures. To build community will take commitment and effort. We have to be committed to it. We have to want it. We have to work toward it. And how do you do that? I was glad to be seated up here with the folks from the Bridge Builders organization. Malcolm Roberts greeted me when I first came in the door, and I said yes, that's one of the ways you build community -- you sit and listen to the other guy's story. Don't ask how long have you been here (every Alaskan asks each other that), or where'd you come from (most Alaskans ask each other that too). Let's go back further, and really build an intercultural connection and ask who were your grandparents? How did your parents meet? Where'd they come from? How'd you ever wind up here should be further down the list. We actually did this as a project in every high school and middle school in this city over the last several years. We got 20 kids together, all from different cultures and races. At the end of the semester, at East High, one student said, "Well, this has been great, Father Michael, one of the best courses we've had. I see now that we here at East High, despite our obvious differences, can all learn to get along." I was pleased with that comment, and then he added, "But not with those kids from Service!" Public schools were founded over a century ago to assimilate the immigrants who were pouring into the United States, passing the Statue of Liberty, being processed in a day or two at Ellis Island, and flooding the east coast of our country. These immigrants spoke, but probably didn't read or write, their native languages. Almost none of them spoke English. They were of diverse languages and cultures and religions, and had very little formal education and few job skills. Public schools took them at the turn of the last century and helped their children become Americans who could function as productive citizens in society. That was the focus of public education at the turn of the last century. If we could do that then, what we need to do now is focus on helping us bridge the gaps, respecting and delighting in each other, understanding that we all have something to learn from other people precisely because they don't play the game of life the same way we do. They don't see reality the same way we do. We don't want to stamp that out of them. We want to be enriched by it. It's a very different approach -- from the melting pot to the salad bowl. The melting pot, by Supreme Court decision, had to be abandoned. The melting pot declared one particular culture to be the national norm -- it was White, Anglo-Saxon, Protestant male. If you could be that or pretend that you had actually come on the Mayflower instead of recently through Ellis Island, you were in. If you couldn't, you were out. Finally, by the 1970s, our country reached the stage where it quit trying to put the whole salad into a blender and push the liquefy button. We recognized that we need to take delight in the fact that, in our salad bowl, the onions are onions, and the green peppers are green peppers, and the cheddar cheese is cheddar cheese, and the Romaine lettuce is the lettuce, and the tomatoes are the tomatoes -- and they all have to be themselves, because they all add flavor and color and texture and make it a better salad. But then what holds it together? Our common commitment is what we promise every day when we say the Pledge of Allegiance in our schools. The last six words are what holds us together. We have a commitment that every child and every adult in our country lives in a place that, in fact, embodies "liberty and justice for all." All -- period. Not all Whites and not Blacks, not all people from Europe and not people from Asia, not all pioneers, but not Natives. It's all. All. Full stop. I believe everybody here's committed to that. I haven't met very many Alaskans who aren't. The challenge is how do we get there? And the answer is we get there slowly. We get there with effort and commitment -- with each one of us hearing the stories of the other, and rejoicing not only in where we connect, but in where we are different, because it's only by both that we discover the common humanity of us all. I Didn't Even Need a Passport! About the Author: The Very Reverend Archpriest Michael J. Oleksa, Th.D., is Dean of St. Innocent Cathedral of Anchorage. He recently served as a member of the Governor's Tolerance Commission and the Subsistence Leadership Summit.